A LONG-AWAITED SIGNING. The relationship between Carlos Verona and the Movistar Team started well before he was a professional athlete: the Madrilian still raced as a junior when he was first met by Eusebio Unzué. 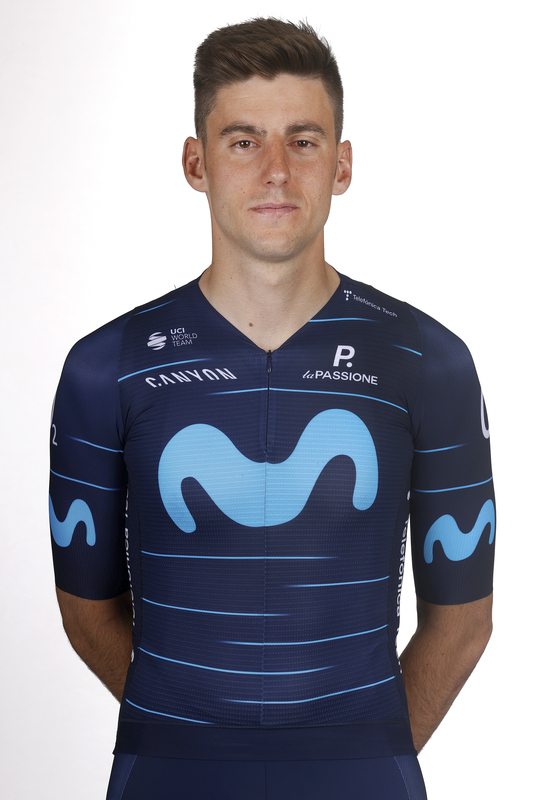 Now, aged 26, the man hailing from San Lorenzo de El Escorial joins the Blues after six years of WorldTour experience -four with Quick Step; the last two with Mitchelton-Scott-, following his debut with Burgos-BH at the age of only 18. Coming ‘home’ is something Carlos really needed: he often says that being part of foreign squads didn’t allow him showing his real character, because of cultural and language barriers. QUALITY FOR ALL TERRAINS. A tall, strong allrounder (1.86m, 68kg), able to get through the biggest mountains as well as riding strong on hilly courses and flat terrain, Verona has two Giro d’Italia appearances and three Vuelta a España caps to his name. The last few seasons have seen the Spaniard support world-class leaders, such as Esteban Chaves and the Yates brothers, without leaving individual aspirations aside either. In 2018, Carlos has notched up a 2nd place in the GP Miguel Indurain (behind future team-mate Valverde), a 4th spot on stage five of the Vuelta al País Vasco and KON jerseys at the ‘Itzulia’ and the Norwegian Tour des Fjords. WANTED TO RACE WITH ‘BALA’. Carlos admits that one of the reasons leading him to signing with the Blues was sharing teams with Alejandro Valverde. “It’s something that every rider in my generation can be excited about,” even if he was just a kid when ‘Bala’ was first shining into the pro peloton. He also underlines the importance of riding alongside other legendary names of the Spanish peloton, such as Imanol Erviti or José Joaquín Rojas. All in all, the Blues will be glad to enjoy an expert, yet young team-mate in Verona in 2019. Carlos isn’t the only household name in his family. His sister, Marta, is also known in Spain, but not because of bikes, rather than cuisine: she was the winner of the sixth edition of the popular TV show MasterChef in our country. They shared a video together on Carlos’s YouTube channel, cooking some natural energy bars without gluten. More importantly than a rider, he’s a husband and dad – of two! Following the birth of his first child, Berta, in 2017, a new baby is coming in 2019 for his wife, . On the podium of the 2018 GP Indurain. On the breakaway at the 2018 Itzulia. Always reliable at all terrains. Part of the Quick Step team in 2013-2016. Verona on stage two of the 2019 Itzulia Basque Country. Verona on stage one of the 2019 Itzulia Basque Country. Verona at the 2019 GP Miguel Indurain. Verona on stage seven of the 2019 Volta a Catalunya. Verona on stage five of the 2019 Volta a Catalunya. Verona on stage two of the 2019 Volta a Catalunya. Verona on stage one of the 2019 Volta a Catalunya. Verona on stage five of the 2019 Vuelta a Andalucía. Verona on stage three of the 2019 Vuelta a Andalucía. Verona on stage two of the 2019 Vuelta a Andalucía. Verona on stage one of the 2019 Vuelta a Andalucía. Verona at the 2019 Trofeo Playa de Palma – Palma. Verona at the 2019 Mallorca training camp at the Rafa Nadal Sports Centre. Carlos Verona’s official portrait for the 2019 season.